Right now I’m doing pretty okay actually. I thought of something, and wanted to share it with you guys. I’m going to bed right now.. and I figured.. I’m going to bed with a smile. Not just any smile. 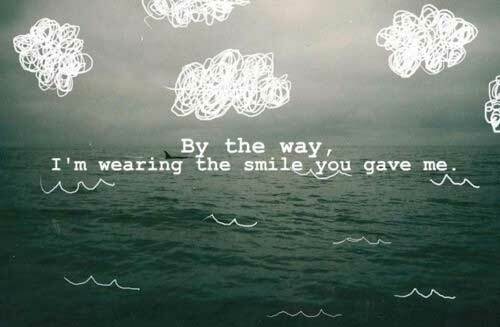 A smile someone gave me, with just being who he is. Also for giving me the lift up to work through, the faith, the strength, the courage and so much more. I am so happy right now. I don’t even know why. I guess a mix of things. Had delicious lunch! I’m done with grocery shopping (I hate that). Home again. My mum is coming over to watch the voice with me! Tomorrow I’m going to my sisters, which means I’ll see my niece and nephew (her cat and dog) again! Plus my mum is making a pie for tomorrow 🙂 ! I also bought some treats for the cat and dog. The cat was easy, she’s 19 (and deaf..), but she loves food and especially treats. The one I bought are kind of expensive if you keep buying it, but every once in a while is manageable! So i know she’ll be happy with it. The dog (chihuahua, and a puppy 😛 ) is a lot more difficult. I bought this tiny dog treats, haha, which we’ll probably have to break in 2 aswell. He’s kind of a hand full, of course since he is a puppy. But he’s very shy and anti-social against strangers. So whenever I go there, he’ll growl at me at first xD, it takes a while for him to get used to me. But whenever he comes here, its fine. I guess he links me to the house. And doesn’t understand it’s the same person going to his house 😛 . Ah anyway, he’s soo adorable!! I also love how my sister and I always bring something small for our ‘children’ hahaha. When she comes over, she’ll always bring something for my cats as well. Anyway, I’m excited! To see my sister, her fiancée and the cat and dog 🙂 . Probably gonna make new pictures with the dog haha. Did the same with my mum’s kitten. He is really annoying though! Super wild and naughty! With a cat it’s different, because cats are able to do more… my sisters puppy can’t even get on the couch by himself 😛 . Anyway, my mum’s cat is a real monster 😉 he’s sweet. But he doesn’t like to cuddle. I used to give him kisses, but he never liked it. He’d put his front paws on my mouth and pull himself away and turn his head xD. He just wants to be wild and play, haha. He’s cute as well, but I don’t see him a lot anymore. Sending some light and happiness to all of you who need it!